Toku | Bentel & Bentel Architects/Planners A.I.A. TOKU, MANHASSET, NY - A pan-Asian restaurant located in the Americana Manhasset, Toku accessorizes a center of design and fashion just outside of New York City. Our ambition was to carry out the project in a manner that transformed a long, narrow retail space into a warm, open series of dining areas that flow seamlessly from the front to the rear without sacrificing intimacy in the dining experience. Long, rectangular planes at the walls and ceilings defined by their material surface and frames of wood or steel slide from front to rear to reinforce the trajectory of vision from front to back. Mirror located in the gaps between these planes create a strong cross axial explosion of illusionary space. Artworks strategically located to terminate views complete the spatial experiment by drawing the eye to distant locations in the plan at the same time that they terminate the view and close the composition. In the end, the space is both spatially open and territorially bounded, provoking a feeling of extension and boundary. The idea of a residential courtyard underlies this organizational concept: one has the feeling of being both inside and outside. The material palette is simple and rich, combining stone, metal, wood and glass in a manner that takes advantage of their color, texture and reflectivity in the overall composition. 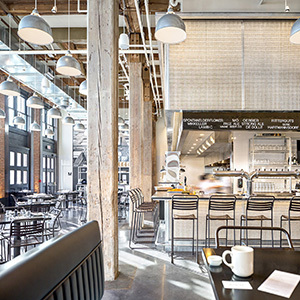 The two prevailing color groups – a warm, dark group anchored by black slate, wenge, and blackened steel versus a sparkling and shimmering light group structured around the porcelain white of the ceiling, backlit onyx, white leather, white sheers and white washed wood plank – interlock around the central axis of the restaurant. The matte dark floor and wall finishes are set off against the shiny and glowing light wall and ceiling, the parts interlocking in the manner of yin and yang. Light, both natural and artificial, plays an important role in the space as well. Conscious that we were on the north-facing side of the building, we developed a façade of translucent glass with an adjacent skylight to the south that permits sunlight to fall on its back. In this way, bright sunlight fills the space throughout the day. At night, the translucent glass is backlit to provide a glowing plane. The skylight also introduces natural light into the core of the restaurant though it is filtered through a large fabric “lantern.” At night, concealed lighting permits the dome to glow, illuminating the lantern from within. There are no conventional decorative electric light fixtures, all illumination being either from concealed sources or candlelight.